The Galapagos’ Floreana Island has a history cloaked in mystery. There are unsolved murders, love triangles and old pirate caves to explore, as well as the natural wonders that the Galapagos Islands are deservedly famous for. We recommend that travelers learn a bit about the Island’s history prior to visiting to set the stage. There are several options, including the 2013 documentary “The Galápagos Affair: Satan Came to Eden,” and the riveting read “Satan Came to Eden” by Dore Strauch. Delving into either gives wonderful context to spending time on Floreana. 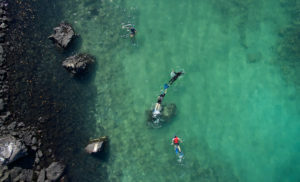 While the old Galapagos way of life has been slowly disappearing, Floreana’s population of fewer than 150 people has fought to keep the special character of their Island intact. 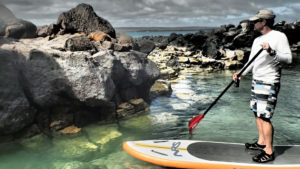 The toughest and most interesting people in the Galapagos are found in Floreana, and the few visitors who choose to stay on the Island, rather than come for a day visit, from a cruise ship get the chance to get to know the Island through their eyes and get a taste of what it is to be a Galapagueño. Visitors to Floreana can visit caves where pirates used to shelter, check out one of the world’s most unique postal boxes (established in 1793! ), see areas where the first settlers homesteaded, and even meet the descendants of those settlers. Travelers can also immerse themselves in nature. 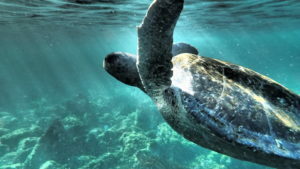 Floreana is home to fantastic snorkeling, a sea lion ‘nursery,’ giant tortoises, marine iguanas, diverse bird life and more. sea turtles. Kayaking, swimming and stand-up paddleboarding are also available for guests at our Floreana Lava Lodge, which is walking distance from the port and the village of Puerto Velasco Ibarra. 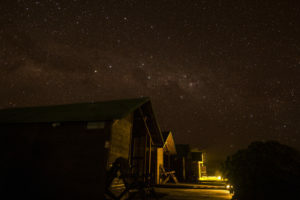 There’s no other place like it in the Galapagos archipelago or perhaps in the world, and our eco-friendly lodge is the perfect place to slow down and soak in the magic, away from the crowds found on other inhabited islands. Simple wooden cabins sit just meters from the water, each with an en suite bathroom and air conditioning. Chairs on the deck allow for sea or star gazing, and a boardwalk leads to the communal dining area where guests can wander down in the morning for a delicious meal grown by the owners. Breakfast includes freshly squeezed juices, along with just-collected eggs brought from the family farm the night before or early in the morning. Discover the real Galapagos Islands on a visit to Floreana Island. Slow down. Breathe. Discover.